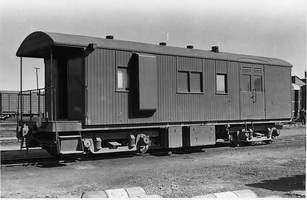 Brakevans with sleeping accomodation, built by the South Australian Railways at its Islington Workshops. 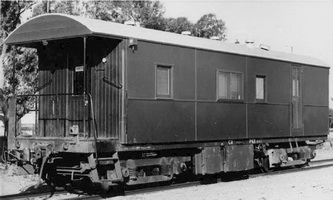 Built by the South Australian Railways Islington Workshops, as "HRB" brakevan with sleeping accomodation. 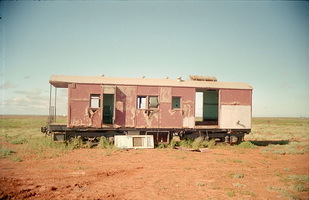 Built by the South Australian Railways Islington Workshops, as a brakevan with sleeping accomodation. Coded by the Commonwealth "HRB". 14.8.1962 Converted to "P 63" pay car. 9.1.1974 Used as a mobile storage room for the rail welding gang. 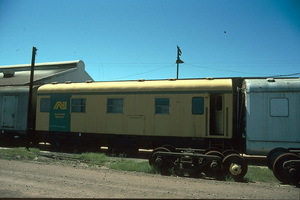 Built by the South Australian Railways Islington Workshops, as a brakevan with sleeping accomodation, coded "HRB". 14.8.1979 Underframe converted to "R 3179". 18.5.1966 Rebuilt brakevan body with steel plate. Dining, cooking, toilet and shower facilities provided. - Allocated to CME Parkeston. 1.1999 Sold to a buyer from Geelong, Victoria. 14.8.1979 Underframe converted to "R 3195". 16.8.1955 Converted to "HP 67" pay car. 12.5.1964 To "P 67", when alterations were made to the layout of the car. Built by the South Australian Railways Islington Workshops, entered service as a brakevan with sleeping accomodation for 2. Coded "HRB". 18.12.1969 Converted to "HRG 68" powervan. 20.6.1989 At Pimba on private property alongside the main road.